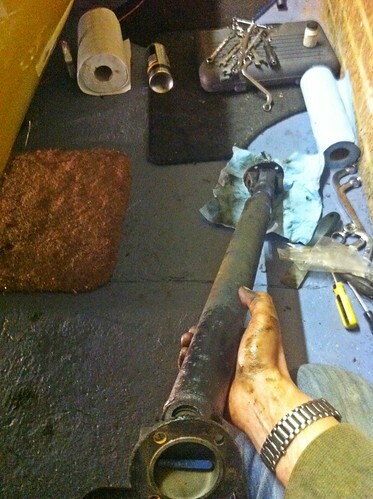 After the nightmare of the weekend, it was a relief that the fix would likely be a simple replacement of the propshaft. I sourced the new prop from MGOC; I'd hoped for a new one, but there was no stock available so I went for a refurbished one instead. This does mean I'll have to return my old one in exchange, but did work out cheaper. The prop is held on by just 8 bolts. At the gearbox the bolts are semi-captive - they're loose in their fittings but you'd have to actually remove the flange to take them out; the bolts here also have special heads to lock them against the flange when tightened - at the diff end they're just standard bolts and nuts. Removing the nuts is simple but fiddly. I had the back of the car on axle stands, so to hold the shaft in place I had to apply the handbrake. This meant that each time I moved to the next bolt I had to release the brake, rotate the shaft to show the next nut and reapply the brake. As I said, fiddly but not difficult. Once all the bolts were released, the propshaft can just be pulled forward slightly and then dropped backwards through the tunnel towards the diff. Putting the new one back in is just as simple and fiddly! A quick test of the new prop showed no problems - the real test would be the next weekend with a 400 mile round-trip to Blenheim Palace.